Hradec Králové not only has a well preserved historic old town, it also has some of the Czech Republic’s best examples of early 20th century architecture. In the mid 1700's, because of it’s location in the tense borderlands between the Austrian Empire and Prussia, Hradec Králové was been designated a fortress town, and its old medieval fortifications were strengthened and extended until the central city was surrounded by barracks and ramparts, thick brick walls, moats and a clearfelled area of some hundreds of metres. Once the walls became obsolete they started to be demolished in 1893. The demolition of all these structures took years, but when it was complete, it left city planners and architects a clean canvas to work on. The most outstanding constructions that grew up in these parts of Hradec Králové are the work of two architects; Jan Kotěra (1871-1923) and his one time pupil and employee Josef Gočár (1880-1945). Jan Kotěra was born in South Moravia and studied in several places before ending up at the Vienna Academy of Applied Arts to study under professor Otto Wagner. As such Kotěra knew and was a contemporary of artists and architects like Josef Hoffman, Jož Plečník, and Adolf Loos. 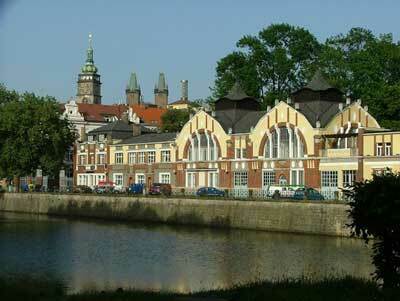 In the early years of the 20th century Kotěra designed several homes, but his first big public contract was for the Okresní dům in Hradec Králové in 1902. Soon after and metres away followed the design and construction of the Museum of East Bohemia, a monumental asymmetrical building that faces the Labe River and still looks fresh and modern today. Prominent Kotěra designs elsewhere in the Czech lands include the Narodní Dům (National House) in Prostějov, Tomáš Bata’s villa in Zlín and the Slavia Bank in Sarajevo. Josef Gočár studied under and worked for Kotěra in the first years of the 20th century designing, among other things, residential buildings in Hradec Králové. In 1909, his first large solo project was the staircase that leads from beside the Church of the Assumption on the main square of Hradec Králové down through the old city walls. Other prominent Gočár works in Hradec Králové include the Anglobank, the state grammar school and the Hussite ‘Ambrose Church’. All of these are in the area between the old town and the train station, but on the opposite side of the historic centre is his final masterwork, the offices of the regional government and financial department, now used by the City of Hradec Králové (Magistrát města HK). Gočár’s best known work outside Hradec Králové is the House of the Black Madonna in Prague.